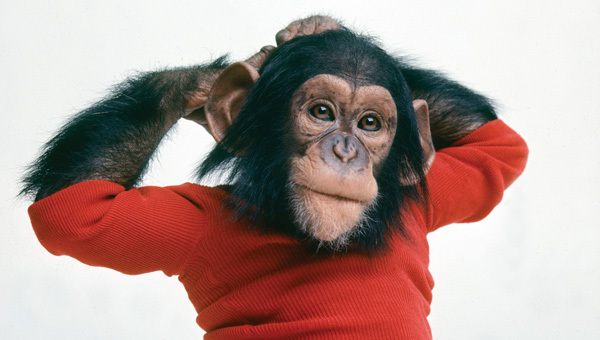 Fourth Row Center: Film Writings by Jason Bailey: In Theaters: "Project Nim"
Nim the chimp was born in 1973 at the Institute for Primate Studies in Oklahoma. A few days later, he was taken from his mother Carolyn and placed in the care of Stephanie Lafarge, a graduate student of Columbia University professor Herb Terrace. Nim would be the object of Terrace’s language experiment, which theorized that, if treated like a human infant, a chimpanzee could learn to communicate like one—the “nature vs. nurture” argument, tested in an extended family. Glancing at the promotional materials, I presumed Project Nim would begin and end with the experiment. I was very, very wrong. Nim’s story is told by director James Marsh and producer Simon Chinn, whose previous documentary collaboration was the masterful Oscar-winner Man On Wire. (Marsh also directed Red Riding 1980—for my money, the best of the Red Riding trilogy.) They tell the story, as they did that one, with a mixture of fascinating archival footage, photos, new interviews, and complimentary recreations. It is a short but patient picture, examining first how Nim was raised by the Lafarges as not just a child, but as a hippie child; what harm is there in a sip of alcohol, a puff on a joint, a sexual fascination with his human “mother”? “It was the ‘70s,” daughter Jenny shrugs. Marsh doesn’t poke fun at the stranger elements of the story—he acknowledges them, yes (and not without humor), and then moves on. But he takes the tale seriously, keying in on the power struggle that erupted between Stephanie and Laura, the “teacher” who was brought in to advance Nim’s sign language; there’s no narration, so there’s no blatant commentary, but much is said in how the filmmakers expertly intercut their contradictory points-of-view. Dr. Terrace eventually decides that Stephanie’s home isn’t the most productive atmosphere for his experiment, so he removes her from the equation and moves Nim and Laura out to a country estate, bringing on a couple of new teachers. Their life there is idyllic; the images of Nim and his cat friend are off-the-charts cute. Bill and Joyce, the two new teachers, fall in love; so, after a fashion, do Laura and Terrace. That’s where things start to get sticky—you can’t “control” these inter-personal relationships, nor can you control a strong, fast-growing chimpanzee, whose dangers are slowly becoming a factor. “You can’t give human nurturing to an animal that could kill you,” Laura notes. Marsh foreshadows that conundrum with palpable tension. And more than that I will not say, as one of the pleasures of Project Nim is how its fabulous, fascinating story unfolds, full of stranger-than-fiction twists and colorful characters. Suffice it to say that what happens to Nim is genuinely shocking, and it’s a testament to the power of the picture that we’re so upset, so affected by the events it recounts. Silly as it may be to say, we feel like we actually know this chimp; late in the film, there’s a shot of him sitting in a tire, laying back, and he just looks miserable. We feel for him. We’ve gone on a journey with him. Marsh is a confident, assured documentary filmmaker; his pacing and construction is swift and engaging, his reenactments helpful without encroaching. As with any good documentarian, he doesn’t have to tell us who the villains are—he just gives them enough rope to hang themselves. Suffice it to say that Dr. Terrace does not come off well; Marsh just allows him to keep insisting that his past and present romances with these attractive female grad students have no effect on the project, and when an interpreter leaves the experiment after having her face ripped open by Nim, his shrugs, “You just can’t count on having outstanding teachers all the time.” Thanks, doc! Some of the filmmaking is too self-consciously stylized (the tracking shots to and away from the interview subjects are a bit too much), but Marsh is indisputably gifted at harnessing the emotional power of his stories; Bill and Joyce still nurse open wounds (“We did a disservice to that soul,” she says today, “and shame on us”), and a later caretaker, a good-natured Grateful Dead fan named Bob, becomes something of a third-act hero. But we’re still not quite prepared for how extraordinary and moving the conclusion of Project Nim is. This is a tricky, complicated story, full of pitfalls and trap doors for lesser filmmakers. Marsh and Chinn bring it off without a hitch. This is a wonderful film. "Project Nim" is now playing in limited release.